BOTTOM ROW – L – R – ZACHERY MCGULL, MICHAEL HOWARD, CHRIS WHITAKER. 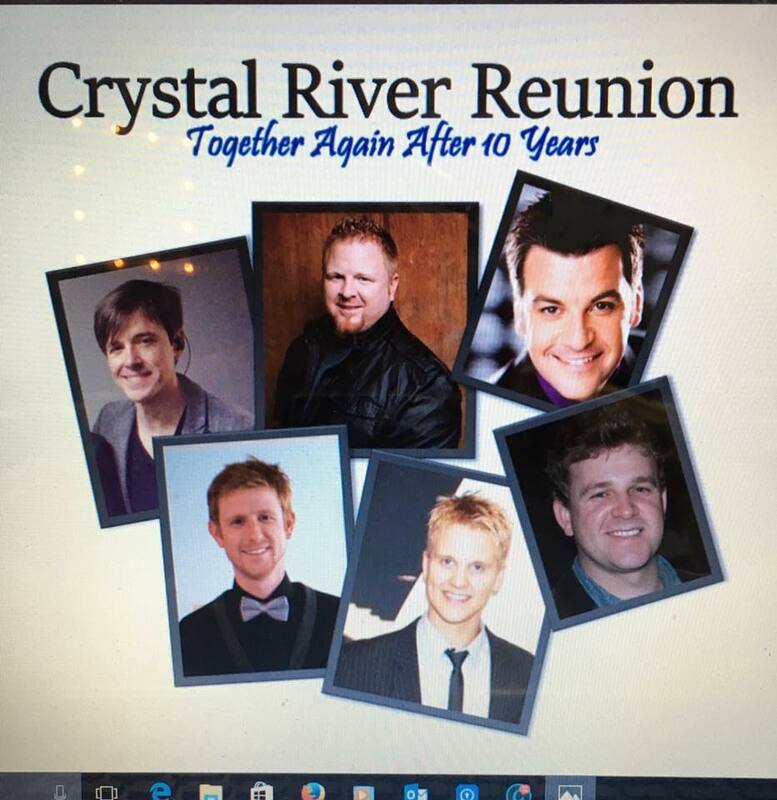 In 2005 four young men got together to form a gospel quartet called Crystal River. All four had been friends and were from the Knoxville area. Zackery McGill formed the group and joining him was Jeremy Lile, Dusty Barrett and Jeff Snyder. David Hoskins a DJ at a Knoxville radio station help the guys get started. Later they signed with the Becky Simmons Agency and recorded several of Glenn Bates songs. 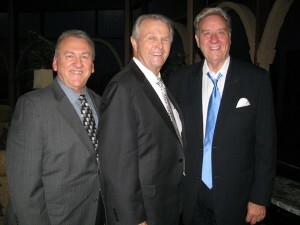 During the time they were singing, Jeff Snyder left the group to sing with The Greens and later Mike Bowling Family. Chris Whitaker, who had sung with Won by One, replaced Jeff. 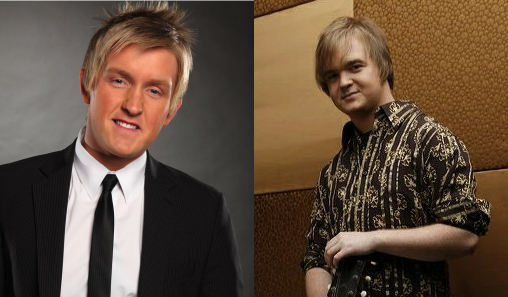 Jeremy Lile left the group to become the bass singer for Brian Free and Assurance. The group remained a trio for the remainder of the time. They also brought Michael Howard aboard to play the piano for the group. Zack, Dusty, Chris and Michael remain with the group until they disband with the final concert at Sunrise Baptist Church in Lawrenceville, GA. Ten years from the beginning they are all back for one weekend for a three day concert reunion. Welcome back, Crystal River! DECEMBER 2 – 7:00 PM – SOLID ROCK BAPTIST CHURCH, 2327 OLD GREENBRIER HWY., GREENBRIER, TN. DECEMBER 4 – 6:30 PM – RIDGEVIEW BAPTIST CHURCH, 6125 LACY ROAD, KNOXVILLE, TN. 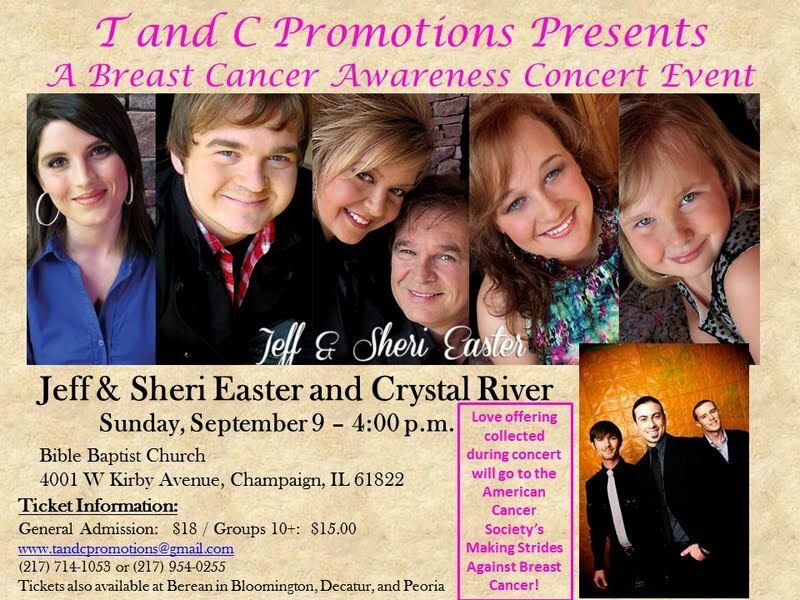 The American Cancer Society’s Making Strides Against Breast Cancer in Champaign, Illinois is teaming up with T and C Promotions from Central Illinois for a special concert on Sunday, September 9 with Jeff & Sheri Easter and Crystal River. This special Breast Cancer Awareness Concert Event will be taking place at 4:00 p.m. at Bible Baptist Church. General Admission tickets are available for $18.00 through www.attendstar.com or www.tandcpromotions.com. Special pricing available for groups of 10+ tickets for $15.00 each. Doors open at 3:00 p.m. – No reserved seating. A love offering will be collected to be donated to the Making Strides Against Breast Cancer. T and C Promotions will be at the Annual Kick-off Breakfast selling tickets on August 30. Call 217-356-9076 or visit www.makingstrideschampaign.com to save your seat at this breakfast. The reason for this event: Sheri Easter is a breast cancer survivor and supports others going through breast cancer – not just the patient; the family – all is important to her. Crystal River, from Winder, GA will be part of a Tornado Benefit in Piedmont, AL on May 28th, 2011 from 11a-5p. Crystal River will perform from 4p-5p that day, but will be serving the people who were effected by the tornado before hand. There will be firetrucks, ambulances, face painting, other special music, games, and so much more that day. The event will take place at Veterans Park in Piedmont, Alabama located off Memorial Drive. Crystal River is honored to take part in this special day in a city and county that was ravaged by the tornado that left damage from Tuscaloosa, AL all the way into Georgia. Piedmont was devastated when the F4 tornado swept through on two sides of the city on April 27th. For more information please contact Gerri Moon at 256-239-4440.